Mobility services are frequently being positioned as part of broader application transformation offerings, enabling enterprises to support the bring-your-own-device (BYOD) approach, with the development of enterprise app stores and the ability to leverage personal devices for business functions. 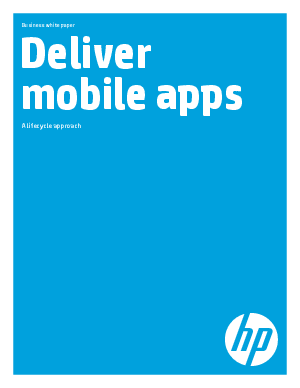 This white paper describes software and services that accelerate and simplify the creation of internally developed or “in-house” enterprise mobile applications. It also describes how to deploy and manage these mobile apps on both company-provided and “bring-your-own” smartphones and tablet computers. Solving the complete mobile app lifecycle means transforming enterprise apps for multiscreen devices; facilitating design, testing, security, performance, management, and compliance to reach new customers and employee expectations.